Daughter-dear is a master at fabric gift bags, so when it was her special day, I couldn't resist stitching one up for her. 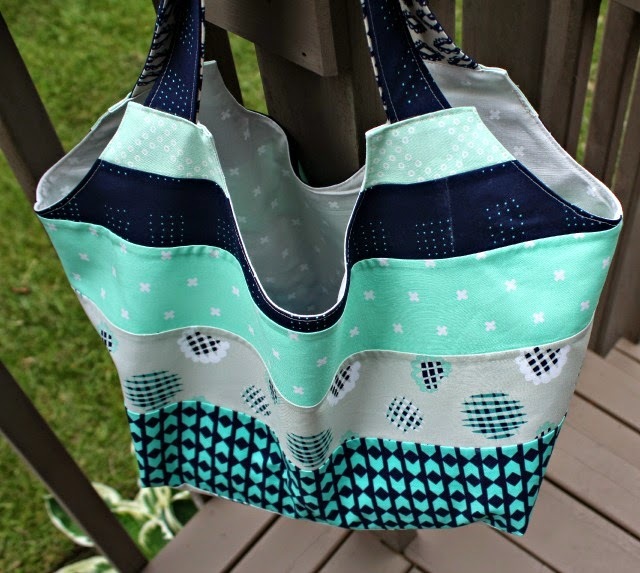 Rather than my typical draw-string bag, I went for the Big Patchwork Tote by Ayumi Mills/Pink Penguin from Krista Hennebury's book, Make It, Take It: 16 Cute and Clever Projects to Sew with Friends. 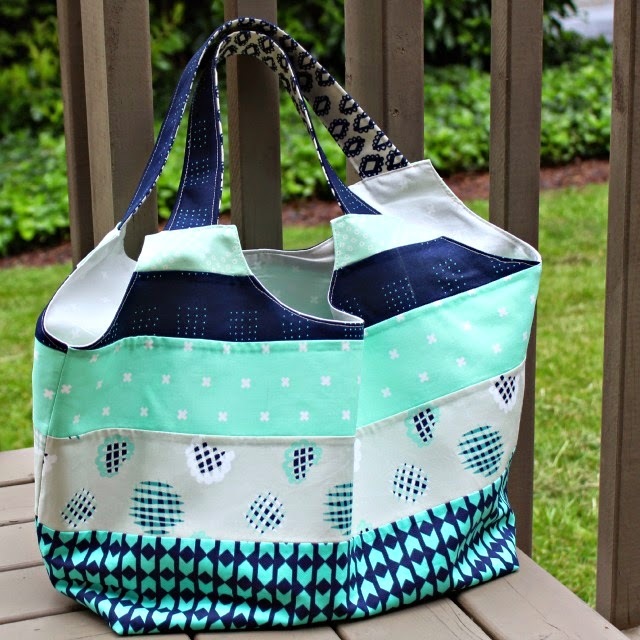 I had made the Little Patchwork Tote a while back, and knew it wouldn't hold Rachel's gift. But at 21" wide x 13 1/2" tall, I suspected the larger one would, plus I figured it would be very reusable as a tote. This bag goes together very nicely, and even on the second go-round, the bottom panel came together like magic. I didn't think to get a photo of that, but it's clever construction. One added note, I chose to use Pellon PF101 Shape-Flex interfacing, rather than the fusible fleece or heavy interfacing suggested. Basically, I am just really fond of the woven Shape-Flex, though it obviously made a pretty lightweight, unstructured bag, which I like. And dare I say, I could hardly go wrong mixing and matching my Cotton + Steel prints. I'm pretty sure Rachel was good with that too. lucky Rachel! that's one snazzy gift bag. Very cute and love your fabric combo! I haven't been such a fan of Cotton and Steel - until I saw this absolutely beautiful tote you made. Okay, so maybe I need to take another look at them, right? And you are not alone - I am positively ADDICTED to Shape Flex. I buy it yards at a time and never let myself run out. I don't know which I would take with me to a desert island, SF-101, automotive headliner, or Wonder Clips - can't live without any of them :) Thanks for sharing your lovely work. This is a great gift bag! Gorgeous bag Debbie - love the colours! This is an awesome bag! !